← Alternative, alternate or alternating? So how do I customise Track Changes (and why would I want to?). Previously, we learned about why you might want to use Track Changes and how to find and use it to delete and add text and make comments. Now we’re going to go one step further and customise it all (and you can also find out how to work with a text that contains tracked changes). Customising Track Changes basically makes things more comfortable for you and means you can work in a way that suits you. For example, some people like to cross out text in a document, like if you were editing a written manuscript, while others like to remove the deleted text altogether and place it to one side. How do I customise Track Changes? We’ll look at these in turn, and also at what happens when more than one person makes changes to the document. How do I change the tracking options? To change the tracking options you need to click on the little arrow at the bottom right of the Track Changes button. This gives you another way to turn Track Changes on and off, a menu item to click to access the tracking options, and a final item we’ll look at later on. I think this is fairly self-explanatory. On the left hand side, you can change how the text appears when you do something to it (underline, double underline, etc.) and on the right hand side you can change the colour. How do I customise the balloons? Now we’re moving on to talk about what appears in balloons and what appears “inline” or in the text itself. Important note: This is not how you change what comments themselves look like. For that, you will need to see my posts on comment boxes. Now, personally I don’t like it looking like this, but some people do. For more information than you would ever want on how to further customise your balloons, please see my article on customising comment text. How do I change which changes I can see? I don’t think I need to show you examples of all of these – have a play with them and you can see what’s what. But: REMEMBER – this is all about what YOU can see. The Tracked Changes have not gone away: they’re still on the document, just hidden. So if you send the document to someone else, they can change their view and see all your changes and comments! Eeps! You can only “get rid” of changes and comments by accepting or rejecting them, individually or en masse, and that’s a job for next week’s post. How can I tell which reviewer has made which comments? Again, avoid telling the other person, “Oh, my comments will appear in blue”, as it’s up to the individual and their own computer as to what colours will appear. How do I change my initials in comments? Next time I make a comment, my initials have changed! However, please note that when I change L to LB here, the change takes effect from that moment, and is not applied retrospectively. Well, you can’t have everything! You may want to pin some of your most common choices to the Quick Access Toolbar – read this article to find out how. So, we already knew how to find Track Changes, today we’ve learned how to customise Track Changes so it works just as we want it to. Next time, we’ll be talking about how to work with the Track Changes you, or someone else, has applied to the document, leaving it nice and tidy and clean! And there will be a separate article on formatting comment balloons, coming soon. In the meantime, if you want to customise the text in your comment balloons or it goes all small or runs from right to left, click on the appropriate links to find out what to do. Interesting that I had just googled the problem I was having — that my client’s changes and my changes were both appearing in the same colors. Now I fixed the “By author” choices and I don’t think I’ll have that problem again. I’d forgotten that one of my clients requested that insertion be in red and deletions showed up in green … which disrupted the whole functioning for the rest of my clients! LOL — I forgot to change it all back. Thanks so much for this page of instructions — I’m bookmarking it — just in case this happens again! Thanks for your comment and I’m glad I could help. It’s worth noting though, as I mention in the article, that the colours you choose are applied only to your version, not your client’s … and you may need to send them here, too, if your comments and theirs are not showing in different colours at their end! One thing I’d like to customize — or find a shortcut for — is the “show markup” feature. I frequently want to show only the formatting changes so I can accept them all, but that means clicking on “show markup,” then on “comments” to remove them, then clicking on “show markup” again, then on “insertions and deletions” to remove them, too. Is there an easier way to just choose what I want to show in one step, without choosing or unchoosing each option? If I just want to print the document showing only comments, it requires three to four steps, each time starting with “show markup.” Seems like there must be an easier way. Also, I don’t like the “markup area highlight,” especially when I’m printing (waste of ink), so I have to turn that off each time, too. Do you know if there is a way to change it so the default is NOT showing the highlighted area? Thanks for your comment, Bobbi. Hm, I don’t know that there is a way round that – I would be tempted to add each of those to a button in the Quick Access Toolbar (see the link in the article) and then you can just go click-click-click each time. This is really useful….I’d been trying to work out for a couple of weeks how to change my initials in comments! Thanks Liz. Excellent – so glad I could help! Hi, thank you for the great post – I have a problem that I hope you can tell me how to fix. I had to use three different computers to review a document and I did not realise that my usernames and consequently the track changes colour are all different now. I need to send out the document and I am wondering if there is something that I can do to make sure that all the comments/changes that I made look the same. would appreciate any help. Thanks in advance. Dear Shruti, thank you for your question. I can answer part of it now: the other part I’m going to have to find out for you. 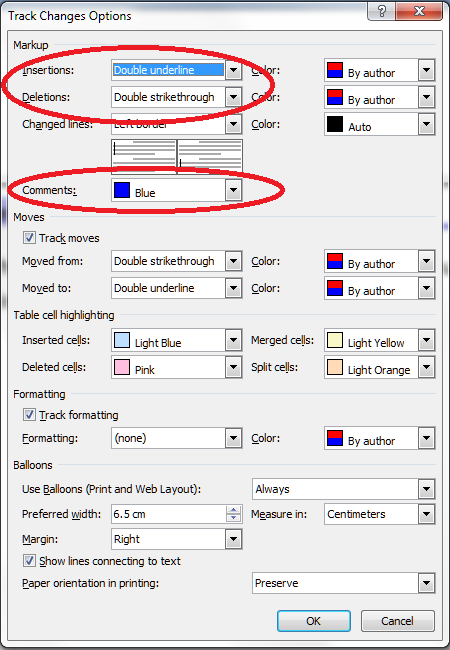 If you want all the comments and all the changes to be in the same colour, use the Track Changes Options section – up at the top you will find options to mark up changes by author and mark up comments by author. 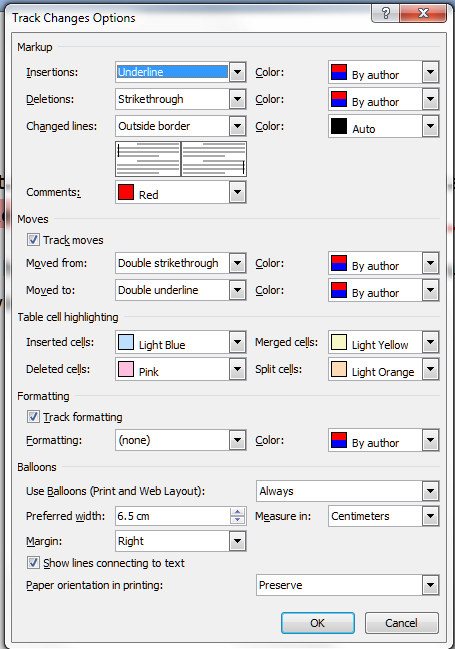 Instead of “by author”, with its two coloured block, choose one of the single colours. All of the changes you made and all of the comments balloons will now be the same colour. As to making the username in the comment boxes the same for all, the basic way to do this would be to follow the change username instructions in this post on each computer with this document open each time (don’t worry about the track changes colour except on your main computer). if you change each one to the same initials, each comment balloon will have the same initials. But I think the comment numbering LB1, LB2 etc., will stay linked to the computer you changed it on, so that might still look odd. I’m looking into that last one for you and will report back if I find any answer! OK, I have checked and it’s not possible to change the name on the comments so that they all match. The only thing that you can do is copy the text in each comment, delete the old comment and add a new one. Obviously you will only need to do this for comments that were not made on the computer you’re using right now. As for everything showing up in different colours – again, remember that the colours are determined by the viewer of the file. So you may need to instruct the people reading the document on how to change all comments and changes to the same colour. I hope that helps a little, anyway. Thank you very much, that does clarify things. Appreciate your taking a look at it! Hi – I was wondering if you could tell me if I can make changes to track changes (e.g. 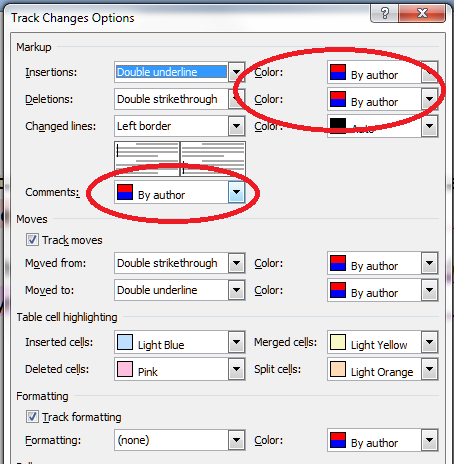 strikethrough or not, and changing the colours of the tracked changes) within a template .dot file and have the same settings applied to all users of a document with that template attached. Thank you for your question, Sally. As far as I know, track changes colours and settings are individual to a user’s settings on their own computer. But watch this space – I’m going to ask some of my peers and see if they know different! Sally, Liz is right. The settings are unfortunately individual to each user’s computer settings. You can set your Track Changes preferences however you like, but tracked changes will appear differently on someone’s computer when they’re looking at your document, depending on that someone’s settings. Liz, Thank you very much. Your information and presentation will do wonders for my business communication students. 1. Is it ok or not ok to post/reference your link in a forum on our Moodle online course site? 2. Do you have a citation function? 3. Do you have a spelling/grammar checker presentation to assist all learners? need a help. We have a legal document which has been reviewed by multiple lawyers in track changes mode. Now I have comments in 2-3 colors with different names. I want to create a document with all changes in same color and one single name (my company name), when I deliver to client. To client it should look like all redlining coming from one company instead of 4 lawyers. Hi Somesh, and thank you for your question. 1. Save a copy of the original document. If you don’t have a copy, save the current document under a different name and reject all of the changes. You should be left with the original document in its original form. 2. Accept all changes on the new document. 3. Use the “Compare” function in Word (Review – Compare – press F1 for more info) and get Word to compare both versions and mark up what’s changed from the original to the new one (make sure you get them the right way round). This reminds me that I should write a post on this topic. I hope this helps – let me know how you get on! While editting a document, I’m just moving text around, not necessarily deleting it. The 1st set of text that I moved was reflected as a “moved text” in a different color. But subsequent text moved isn’t showing up as moved, but as deleted and as new text. Thanks for your comment. Did you perhaps highlight the first section then drag it to its new home, but did Ctrl-C and Ctrl-V or “Edit – cut” and “Edit – paste” on the others? That’s what happened when I tried doing those two different activities. I hope that helps! Great information here thanks a ton. I am having an issue when printing where the deleted items show in the bubbles in word but when I print it actually has the strikethrough instead. Any ideas? Hm, interesting. Which version of Word are you using? I found this help information http://office.microsoft.com/en-gb/word-help/print-a-document-showing-tracked-changes-and-comments-HA001218974.aspx which tells you how to print showing the changes … but you probably know all this already. Let me know what version of Word and I’ll see what I can unearth! Thanks Liz. I am using Word 2010 (32 bit sp2). Using Word (not Windows Explorer), open the document. Print your file. On the Print page, under Settings, click the button that holds the options like “Print all pages” and make sure that the “Print mark-up” is checked. I found it in this question thread http://answers.microsoft.com/en-us/office/forum/office_2010-word/comment-balloons-will-not-print-word-2010/d66bb536-a389-4a1e-830d-6b3fe21f1072 via a Metafilter question where the poster confirmed that this worked for them. So, worth a try. Let me know if it works! Hi Liz. I found that one earlier as well. Those settings are required to print but for whatever reason I can’t get it to print the deleted comments in bubbles instead of the strikethrough. I will keep troubleshooting on my end but if you do find anything I’ll be paying attention. Thanks for your help! And you’ve tried pasting it into a whole new document? Hi Liz, I’m using Word 2010, and when I make a comment it will show my initials “JW”, but as soon as I close the document and re-open or email to someone else, my initials are gone and it shows “A”. I’ve checked under authors and my name and initials are there, not sure why it keeps removing them. Hope you can help! Thanks! Thanks for your comment, Jamie. When someone else opens it, it may well default to their settings. However if you open it again yourself, on the same computer, it should have the same settings. a) is this always the same computer? b) have you tried re-inputting your name and initials in the relevant fields? c) do you have an up to date and legitimate copy of Word? d) have you run a virus check just in case? These are all the things I would recommend to do first. Let me know, though, and I’ll continue to try to help. Thanks for your reply Liz. Just checked it out more thoroughly, it changes my initials when I save the document. So I can have it open, add comments, click save and it will change my initials from “JW” to “A”. Yes, same computer; re-inputted my name and initials, it’s an up to date legit copy, ran a virus scan, all documents. OK – is your computer on a network or a standalone? It may be that some kind of network setting is over-riding things. Aha – my friend Jane Badger might have found the answer – is the document in Compatibility Mode at all? If so, go to Word Options – Trust Center – Settings – Privacy Options and check to see whether “Remove personal information from file properties on save” is enabled. She found this from this page: http://answers.microsoft.com/en-us/office/forum/office_2007-word/user-initials-in-comments-disappearing-upon/3cfc11d5-9f1a-4f60-b205-2ddb9b8896d9 which I may well have found eventually. That’s about Word 2007 but I bet it works for 2010 too. Let me know if that works (and if it does, I’ll write a blog post about it!). Hi Liz, that was it! Hooray – I’m so pleased – and thanks for letting me know. I’d better write a blog post about that, as there are none out there! Jamie – I’ve now written a blog post about it here https://libroediting.com/2013/10/23/help-my-word-comment-box-initials-keep-changing/ so the next person to have this problem will find the solution laid out clearly for them! Thanks for asking in the first place! Hi, I’m editing a document for two groups of people; I’d like to use violet and red for the two groups. is it possible to do this in Word 2013? Thanks for your question, Celina. Unfortunately, the colours go by the author of the changes, and it’s not possible to change them according to who you are addressing them to. Also, don’t forget that whatever you change your colours to is not seen by the reader; if they are using a different login on a different computer, they will see the colours they have attributed to the tracked changes, not your colours. A solution would be to put a spot of highlighting colour at the beginning of the word you are discussing for a particular group. At the end, they can highlight the whole document and click “no highlight” to remove the colours. I hope that helps! I edit large technical documents where groups of changes have been reviewed and approved for incorporation into the master document. I need to be able to associate each particular edit with the identifier with the approved change. Other than saying Change A is blue, Change B is green, can I use/adapt the initial field of the editor to show the Change Identifier while remaining the editor? That way I can show all of Change A or Change B or Changes A and B.
I need to track changes and have the tracking bar on opposite sides of the paper. The even pages the tracking bar should be on the left and the odd pages the tracking bar should be on the right. How do i get this to happen? I don’t think you can do this, as the tracking options are for the whole document. They’re also individual to you, so anything you set on your PC won’t affect what other people see. Is this so that you can print it out in that format? Is MS Word capable of the following. It would be nice if edits in response to comments could be associated with the response to the comment that resulted in the edits. I’m not sure if MS Word can do this. You could then click on the response to be taken to the edited section(s) of the document. Very powerful. If there is a workaround for this, please share. Thanks. Thank you for your question, Terry. I don’t think it can do this. However, I usually find that any edits a client makes in response to one of my comments will generally fall into the section highlighted by the comment in the first place, so they are easy to spot, or the client clicks on the comment and selects New Comment, which pops a reply underneath the comment. I know this isn’t exactly what you meant, but just sharing the way I typically navigate such matters. Thanks for the quick response, Liz. On the project I am supporting, the draft deliverable doc is sent to the customer who reviews it and enters comments. The customer does not make any edits to the doc (suspect this is a customer preference). The owner of the doc then makes edits to the doc in response to each comment with TRK turned on. Edits for a given comment are often scattered throughout out the doc. The doc is then returned to the customer (in two forms: with edits accepted and with TRK still turned on) to allow him to see how each comment was addressed. The fact that the edits can be scattered throughout the doc makes it difficult for the customer to evaluate the comment response. I was hoping (in my wildest dreams) the owner could enter a response to the comment (by right-clicking on the comment) and link the response to all edits associated with the response. This could be done by Word opening a comment edit session which would be ended by the owner when the last edit for a comment is made. Or it could simply require the owner to select the edits before the comment response action is closed. The customer would then click on the response and see a display similar to what one sees when you do doc find. I’m surprised that MS has not come up with a solution to this yet unless they have but it’s done a different way. Thanks again for your quick response. Hi Liz, we have shifted from Word 2010 to Word 2013. In 2010 version when we are working using balloons and make any deletion a mark is put under the word in the position of the deleted letter in text, but in 2013 it just draws a line under the word, so when there is a lot of corrections, it is hard to notice what was deleted. Is there any way to make it like 2010 with a mark under the place of the deleted work within text? I really do not like using inline track changes. Thanks for your question, if you turn on the comment balloons in Track Changes options it will still mark in the balloons what you’ve deleted – does that help? I actually need it to make a clear mark in the text also like 2010, as when there is a lot of corrections the balloons are not helpful. I become unable to see where each correction is done. It shows only a line, but the mark (a small inverted triangle) was so helpful. It shows in the printing but not when I am working on it. Like the one in the screenshot above before the word “repeated”. How can I get it? It disappeared when we shifted to Word 2013. Thank you, this is really useful. First of all, I am very thankful for your work here, your website has helped me a lot! There is something I would like to ask you. I need to make comments on long essays and I would like to insert comments on both sides of the document and being able to choose which comment goes where. For instance, grammar mistakes to the right, vocabulary mistakes to the left. Is it possible to do so on MS Word? Thank you for your kind words and for your question. Unfortunately, Word won’t allow you to do this. I am using Word 2010. A problem that I’ve found when making comments… Let’s say we have two people sending a document back and forth, and adding comments as they iteratively send the document back and forth. John Doe drafts the document and sends it to Mary Smith. Mary Smith adds comments in balloons, with her comments numbered “MS1”, “MS2″, MS3”, etc., then she sends the document back to John. John reviews Mary’s comments and then inserts his own comments on each of Mary’s comments, immediately after each of Mary’s comments. The problem is, instead of the comment balloons being marked as “MS1”, “JD1”, “MS2”, “JD2”, “MS3”, “JD3”, etc., ALL of the comments are re-numbered as “MS1”, “JD2”, “MS3”, “JD4”, “MS5”, “JD6”, where ALL later comments by ANYONE get bumped higher. The problem with this comes if Mary references back to any comment number that she’s added, and then John adds his own comments early in the document, Mary’s reference to another of her later comments won’t hold true. Is there some setting that allows each reviewer to have their own comments sequentially numbered? I don’t believe there is that option. I’ve checked through all the options and the comments box style and there’s nowhere to set this that I can find (sorry!). If you do find a solution, let me know, most of my searches led me back to my own post on how to add comment numbering! is there a way to customize track changes in Word 2016 so that formatting is not tracked by default? I wish I did not have to turn it off every time. Thank you for your question, Anna. Changes to your track changes options should persist across documents as they are saved in Word’s registry rather than per document. You might need to check you don’t have a macro running that is changing this. Another option is you’re working in a corporate system where something is keeping these defaults for all users, rather than just you. Otherwise I suggest setting them as you wish then saving as a template and using that template for a new document, although I can’t promise that will work! I hope that helps a bit; not a problem I’ve come across myself.